Lincolnview’s Karter Tow won the 2017 NWC title in a time of 16 minutes, 44 seconds on the 5,000-meter course at the Van Wert Reservoirs. Minster’s Emma Watcke (1116) is back to defend her 2017 Division III state championship. Jacob Wasson and his Van Wert teammates look to be the hunt for the WBL championship after finishing second in the league in 2017. Johnny Schmiedebusch is among nine lettermen back for Columbus Grove this year. Alyssa Ellerbrock and here Columbus Grove teammates look to successfully defending their Northwest Conference and Putnam County League championships this year. 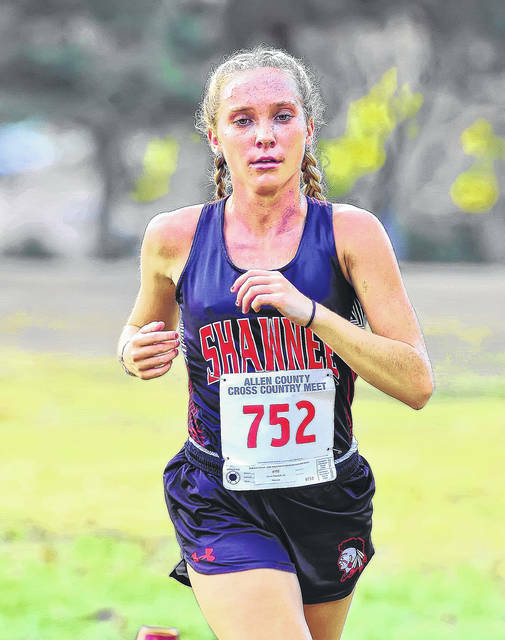 Lexie Marshall is part of a Shawnee team that has back five of its top seven runners from 2017. Will Zeller (pictured) and Ryan Lucke were regional qualifiers for Kalida last year. George Moore returns for Lima Senior this year. Corbin Fingerle is a top runner for Elida’s cross country team and also is a key player for the Bulldogs in soccer. Grant Stump is one of seven letter winners back for Shawnee. Here a look at this year’s high school cross country season by conference. 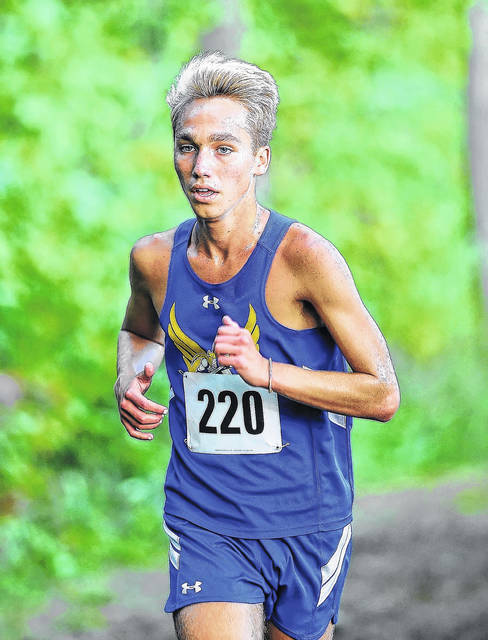 The Lincolnview boys’ cross country team has dominated the Northwest Conference in recent years – coming away with the conference crown the past three seasons. Look for the Lancers to contend once again this fall. 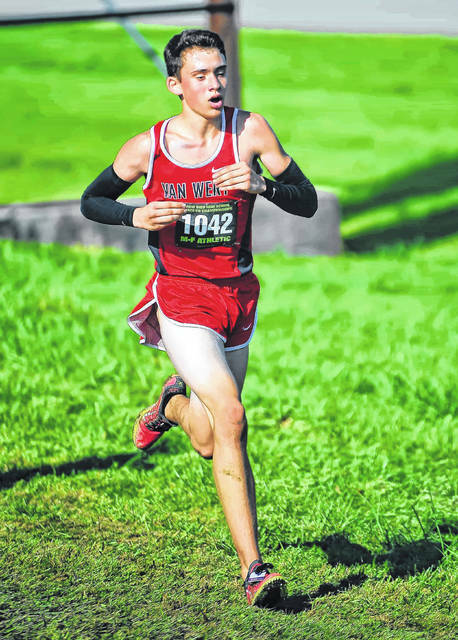 Senior Karter Tow, who won the 2017 NWC title in a time of 16 minutes, 44 seconds on the 5,000-meter course at the Van Wert Reservoirs, leads the list of returners for Lincolnview this fall as the Lancers vie for their fourth consecutive conference title. 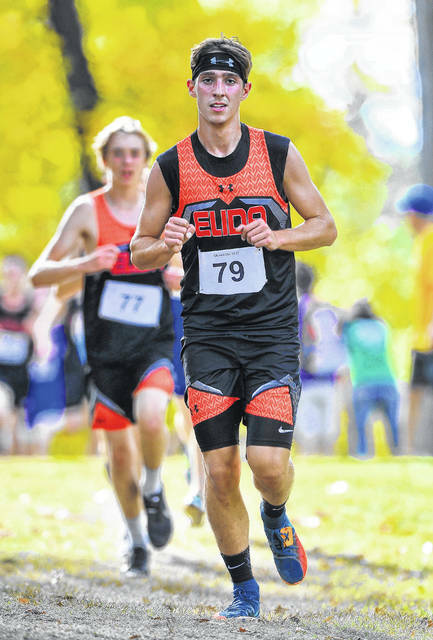 Seniors Jacob Keysor and Alek Bowersock, and juniors Devon Bill and Joe Sadowski return from last season’s pack of top-five runners for Lincolnview. At last season’s state meet at National Trail Raceway in Hebron, Lincolnview placed 14th out of 20 teams in Division III. However, the Lancers will have their hands full in the NWC, as Columbus Grove returns nine lettermen from a team that finished runner-up to Lincolnview at last year’s conference meet. In 2017, Columbus Grove advanced a team to the regionals for the ninth straight season. 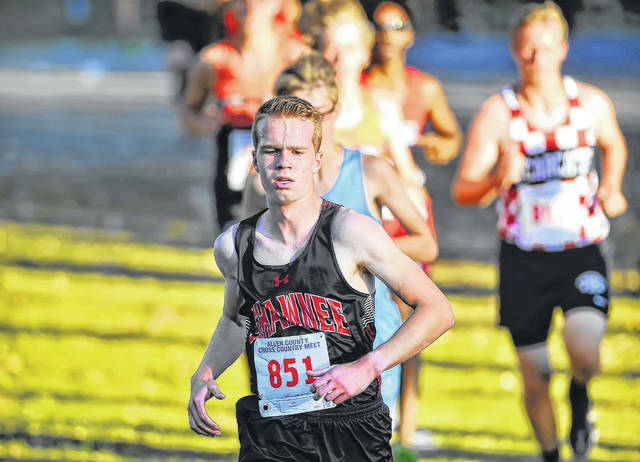 Johnny Schmiedebusch – then a sophomore – finished 52nd in the Division III state meet in 16:56. Joining Schmiedebusch are seniors Grant Mumaugh and Jordan Bellman, juniors Breece Pringle and Tanner Smith, and sophomores Cody Tabler and Derek Birkemeier. On the girls’ side of the NWC title race, Columbus Grove looks to continue its winning ways. The Bulldogs have won the NWC crown the past two seasons. Heading into this season, Columbus Grove is looking to add yet another NWC crown to its resume. Leading the way for the Bulldogs is junior Alyssa Ellerbrock. 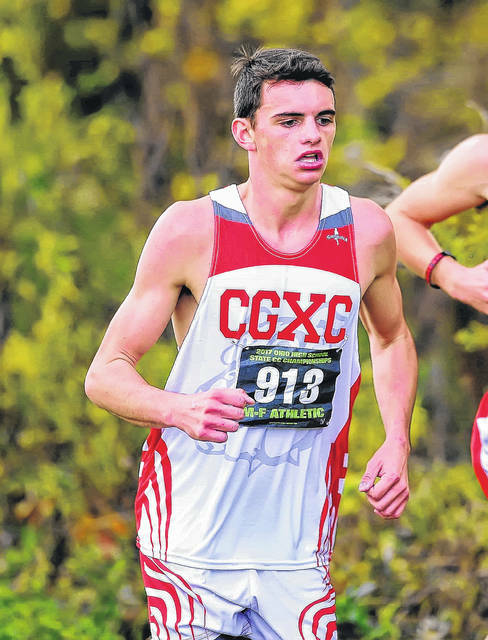 In 2017, Ellerbrock won the NWC title in a time of 19:45. 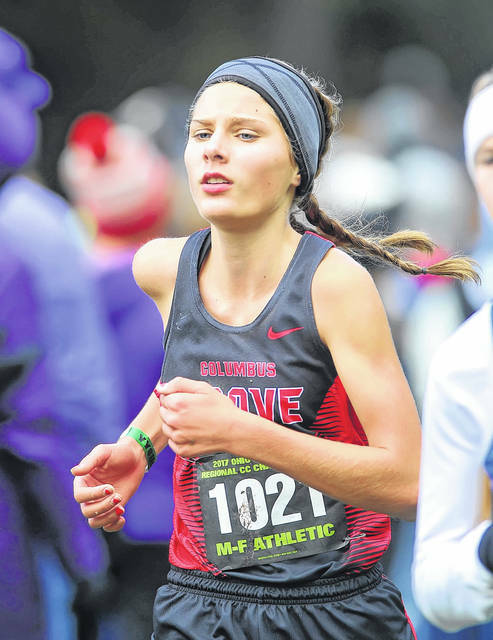 At the Division III state meet, Ellerbrock finished 17th overall (19:17.4) to help lead her team to an eighth-place finish in the 20-team field. Ellerbrock earned all-Ohio honors with her performance at the state meet. Columbus Grove returns seven letterwinners – four of those who competed at last year’s state meet. was a solid No. 3 runner (sometimes No. 2) for the Bulldogs, clocking a PR of 20:07 this past fall. Columbus Grove girls’ coach Jason Jay is in his 12th season at the helm. The Defiance boys’ program has been at the top of the Western Buckeye League 24 times, out of 46 seasons in the league. Defiance has won the WBL title the past three seasons – with Van Wert finishing second all three years. Defiance looks to defend its league title, as the Bulldogs return a slew of letter winners, led by Mhalicki Bronson. 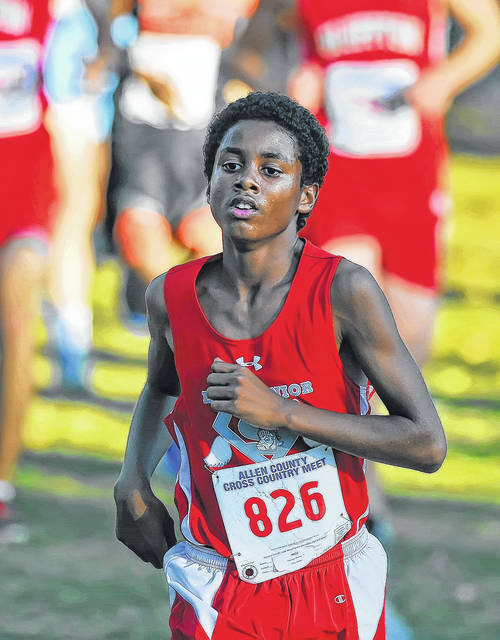 Last year, as a sophomore, Bronson finished 19th at the Division I state meet (16:01.4) to help lead his team to a 15th place finish. At the WBL Championships, Defiance placed its top five runners in the top seven overall spots, to run away with the league title over second-place Van Wert, 18-56. This season, Van Wert is looking to be in the hunt once again. The Cougars return five letterwinners, including sophomore Jacob Wasson, who clocked a personal-best of 16:36 as a freshman. In 2017, Van Wert placed 13th at the Division II state meet. On the girls’ side of the WBL race, Defiance looks to defend its league crown. At last year’s WBL Championships, the Bulldogs placed their five scorers in the top eight overall spots, to run away from second-place Celina, 20-102. Defiance returns 2017’s WBL champion, junior Shay Soukup, as well as runner-up, senior Katie Crites. The Defiance girls’ program has won the WBL title the past four seasons. Shawnee also looks to be in the hunt. Shawnee returns five of its top seven runners from a year ago – including junior Lexie Marshall (ninth at WBL, 20:56.19). The Indians finished fifth in the WBL in 2017. Longtime Shawnee coach Russ Holly is optimistic about the upcoming season for his girls squad. “We have good numbers and look to improve as the season progresses. We will try to advance as many runners as we can in the post season. Our depth and experience should contribute to our overall success,” Holly said. The Wapakoneta girls’ squad looks to contend. The Redskins are led by junior Paige Schneider, who was a Division I regional-qualifier in 2017. Last season, Wapakoneta finished fourth in the WBL. The Minster girls’ program has won the past five MAC titles. In all, Minster has notched 29 out of the 34 MAC crowns that have been handed down in girls cross country. Minster has won the Division III state title the past two seasons. Minster returns all five scorers, including last year’s state champion, junior Emma Watcke. Watcke won last year’s state title in a time of 18:38.4. For the boys, Minster will try to defend its MAC title from a year ago. The Wildcats return four of their top seven runners. Junior Luke Barga, last season’s No. 2 runner for Minster, is the leading returner. Barga finished fourth at the MAC meet. Teammate Jon Albers (Sr.) placed fifth in the conference meet. 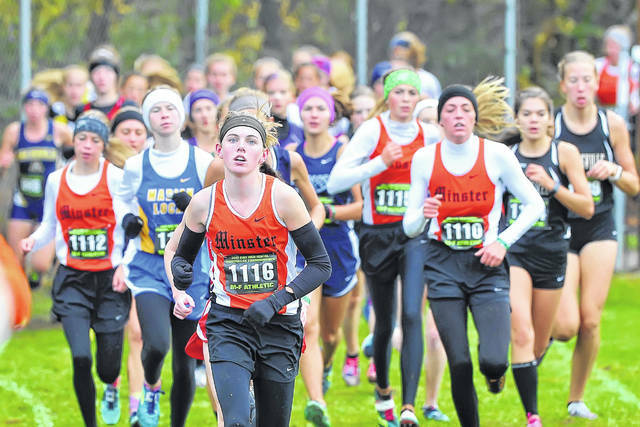 Minster finished 18th in Division III at last year’s state meet. The Parkway boys return their top three performers from a year ago – juniors Kyle Roth and Aaron Bruns, senior Matt Gaerke. Roth was a state-qualifier in 2017. The Columbus Grove boys and girls will attempt to defend their respective Putnam County League titles. 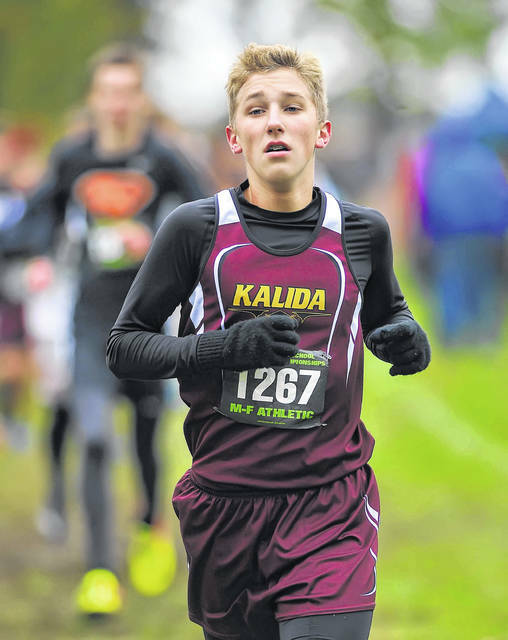 On the boys’ side, Kalida (second at PCL in 2017) returns all seven of its top seven runners from a year ago. Sophomores Will Zeller and Ryan Lucke – both regional qualifiers in 2017 – lead the list of returners for Kalida. Individually, in the area, Lima Central Catholic junior Quentin Potempa returns after making it to the Division III regional at Tiffin in 2017. In the Three Rivers Athletic Conference, Toledo Whitmer returns four of its top seven runners from last year’s boys’ conference champion squad. On the girls’ side of the TRAC, Notre Dame Academy and St. Ursula Academy appear to be the early frontrunners. In the Northwest Central Conference, Upper Scioto Valley senior Brady Hipsher – a Division III regional qualifier in 2017 – returns for the Rams. This entry was tagged alleneast, bath, Bluffton, celina, columbusgrove, continental, crestview, delphosjefferson, delphosstjohns, Elida, hardinnorthern, kalida, kenton, limacentralcatholic, limasenior, lincolnview, marionlocal, millercity, Minster, newbremen, newknoxvilledelphosstjohns, ottawaglandorf, ottoville, pandoragilboa, parkway, paulding, perry, shawnee, Spencerville, sthenry, stmarys, uppersciotovalley, vanwert, Wapakoneta, waynesfieldgoshen. Bookmark the permalink.